January 2007. Another quite start to the year, we had 2 trips booked for 28th/29th December and lost both of them to the weather again. We look forward to seeing our old customers again this year. 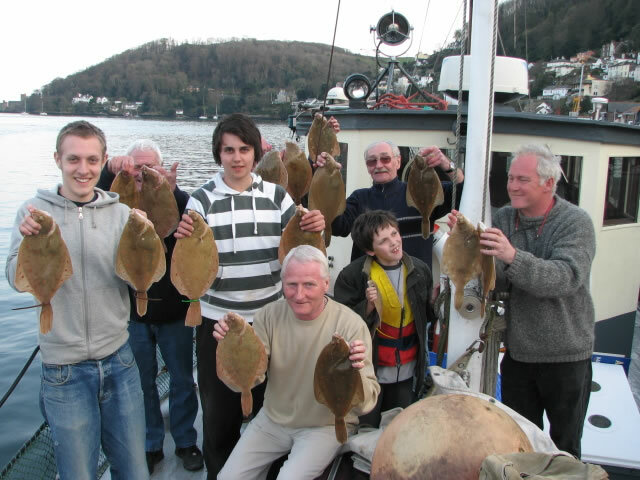 Roll on March when we hope to see a few Plaice on the Banks again. Some good news for anybody that has followed our diary page through 2006 and saw that I was moaning in December 2006 that it looked like we were going to lose the 'Red' diesel, and the tax derogation (get the duty paid on it back) that goes with it. This turned out to be scare-mongering, certainly the leisure fraternity are going to have to pay more for their diesel but the Government have said that charter boats can keep the derogation. A huge sigh of relief for our industry. Customs and Excise explanation for anybody who is interested. Tuesday 30th. 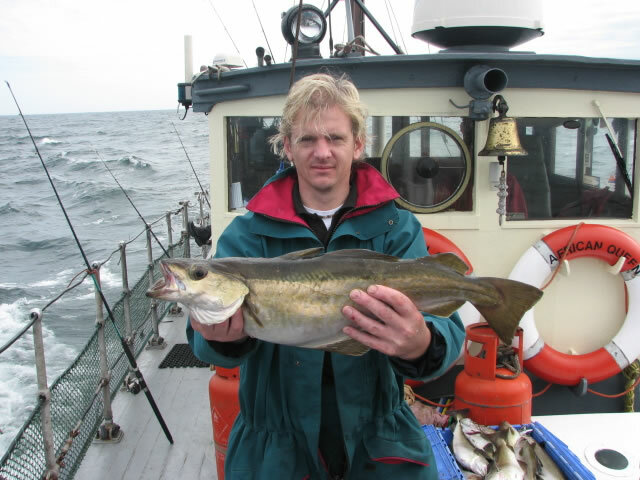 Had a day out today looking for an inshore Cod, no such luck, loads of nice Whiting and not a lot else. We had a little dabble around a couple of wrecks, but the Pollack seem to be late in this year, probably because the water is still quite warm at the moment by our usual Winter standards. One thing we did witness out there that was very distressing, was an awful lot of oiled Guillemots, most already dead and many more dying. I guess the oil must have come from the wreck of the Napoli, beached 30 miles up the coast from us. February 2nd Went out with a few local lads on a rare fine day. 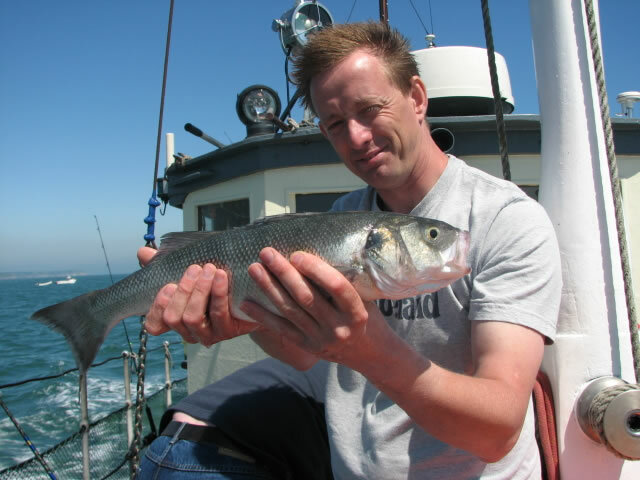 We tried a local mark as I'd heard there were a few small Bass about, we could only manage to catch some Winter Mackerel a few Whiting. 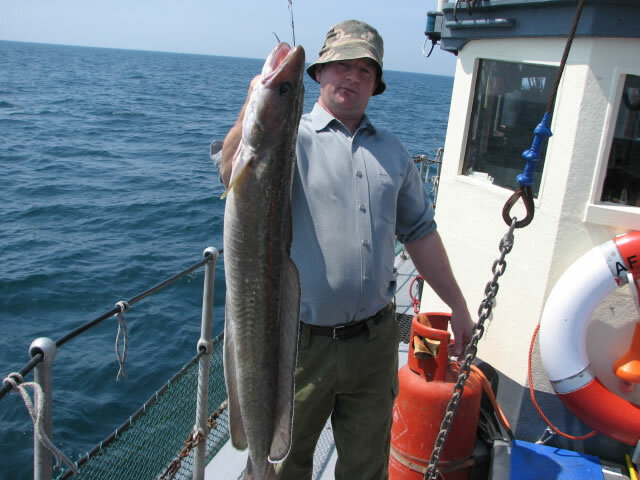 Next stop was the traditional Cod grounds which were again devoid of anything other than Whiting, which seem to be everywhere at the moment. 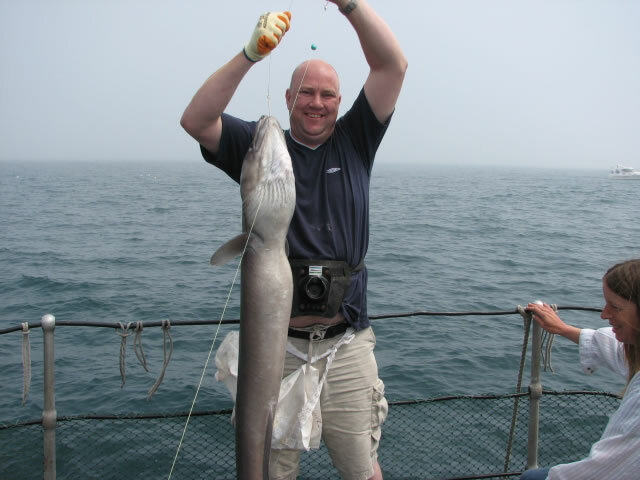 As the big tide slackened, we went offshore to try a couple of wrecks, we caught very little apart from an unexpected Conger Eel of 53lb that gave Sean O something to brag about when we returned to Dartmouth in ever freshening Easterly winds. See piccy on left of page. 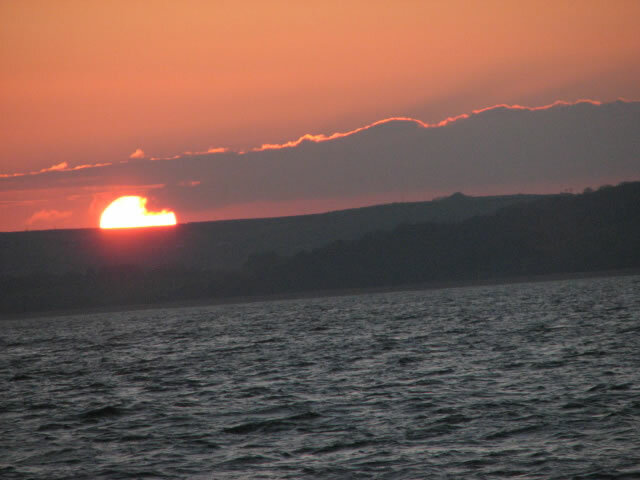 The two pictures below were taken on the way home, Sunset over Start Point, click all pics to enlarge. Sunday March 4th. When is it all going to end? I took this directly from the Rickhanm Weather site this morning. This was the weather at Rickham, last measured at 04 Mar 2007 09:45 GMT In the previous 15 minutes the wind averaged SSE at Strong Gale Force 9, gusting to Storm Force 10. More properly, in the previous 15 minutes the wind was mainly from 162 degrees true at an average wind speed of 43 Knots. It gusted to a maximum of 51 Knots, with a minimum of 12 Knots. The maximum wind speed recorded in the last 12 hours was 61 Knots (Violent Storm Force 11) at 07:40 GMT The air temperature was 10 Celsius (which is 50.0 in Fahrenheit). Allowing for the effect of wind chill, this will feel more like -3.4 Celsius (or 25.9F) and again Monday evening. 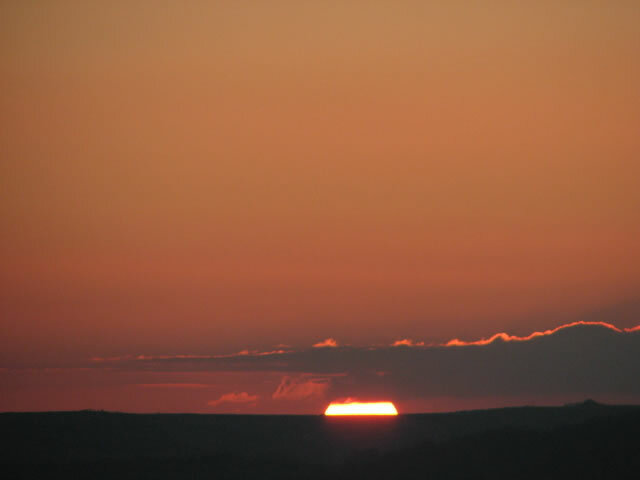 This was the weather at Rickham, last measured at 05 Mar 2007 20:45 GMT. In the previous 15 minutes the wind averaged SSW at Gale Force 8, gusting to Storm Force 10. Saturday 10th. March. 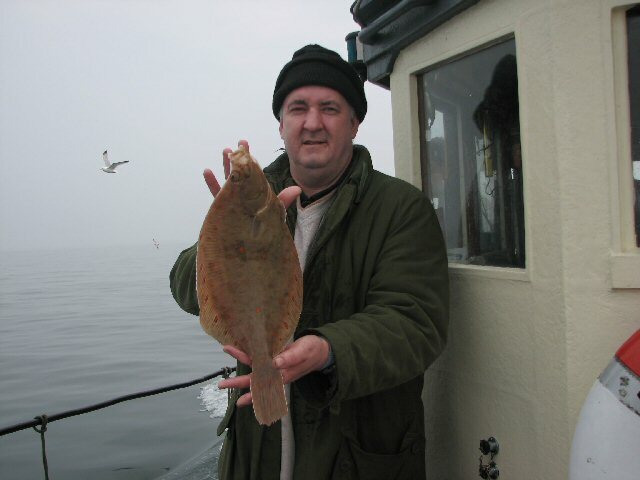 Took out a group to fish the Skerries for an early Plaice, the conditions were once again not ideal for Plaicing as the continuing rough weather had clouded the water on the shallow banks, and from experience we knew it was going to be an uphill struggle to catch a Plaice. 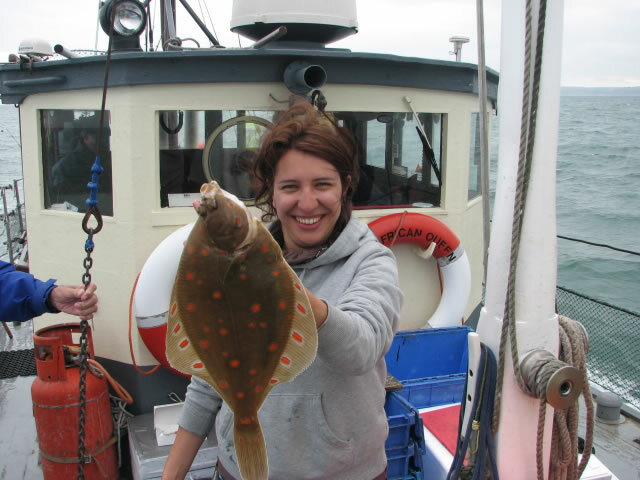 As the conditions deteriorated to a very lumpy sea we opted to shelter and anchor on an inshore reef in the hope of catching a decent Bull Huss. 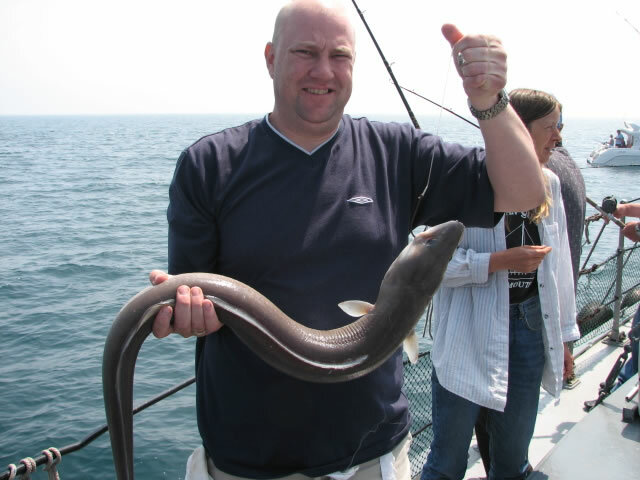 The end result was an enjoyable day, basking in some glorious Spring sunshine, and the lads competing with a pack of very obliging Dogfish (Sand Sharks as they are known locally) total catch 48. All returned bar 4 for the pot. Friday 16th. 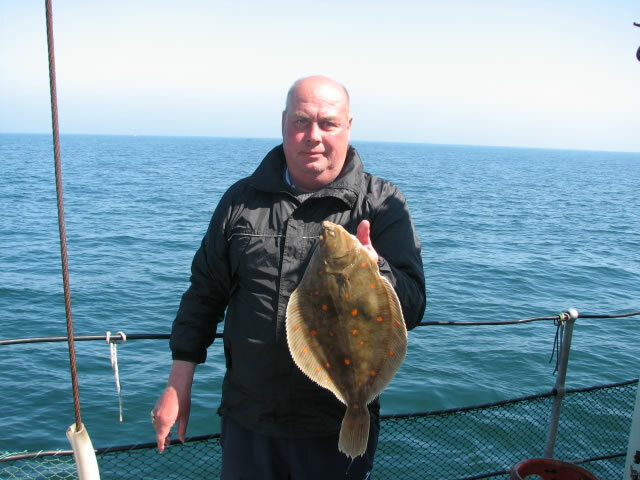 First Plaice trip of the year, conditions were superb, light winds, sunny and warm, we had a nice Plaice on the first drift, and then picked up 1 or 2 per drift after that untill the tide turned, the wind picked up from the North, the temperature dropped to resemble Siberia and the fish went off the feed. We only managed 8, but its early season yet, and nice to see them. Sat/Sun17th/18 March. 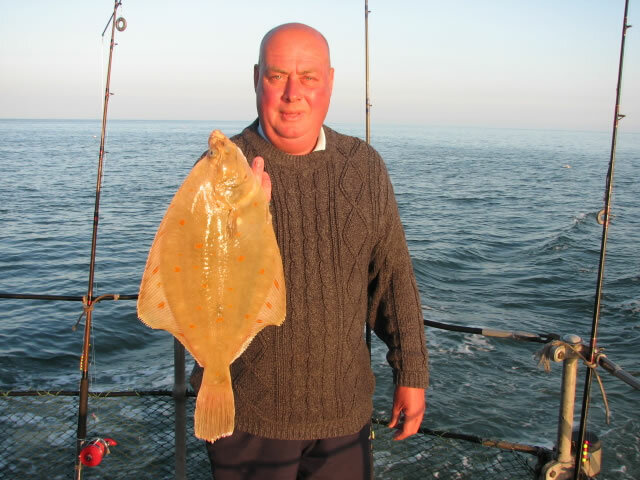 Another weekends fishing gone, again I took this from the Rickham weather site. "This was the weather at Rickham, last measured at 18 Mar 2007 13:15 GMT. In the previous 15 minutes the wind averaged WNW at Force 5, gusting to Strong Gale Force 9. The maximum wind speed recorded in the last 12 hours was 52 Knots (Storm Force 10) at 12:20 GMT. April 1st This was the weather at Rickham, last measured at 01 Apr 2007 08:45 BST In the previous 15 minutes the wind averaged ENE at Force 6, gusting to Gale Force 8. 4th.This was the weather at Rickham, last measured at 04 Apr 2007 09:45 BST In the previous 15 minutes the wind averaged NNE at Force 5, gusting to Force 7. Friday 6th.-Friday 13th. Some decent weather to coincide with the Easter break. 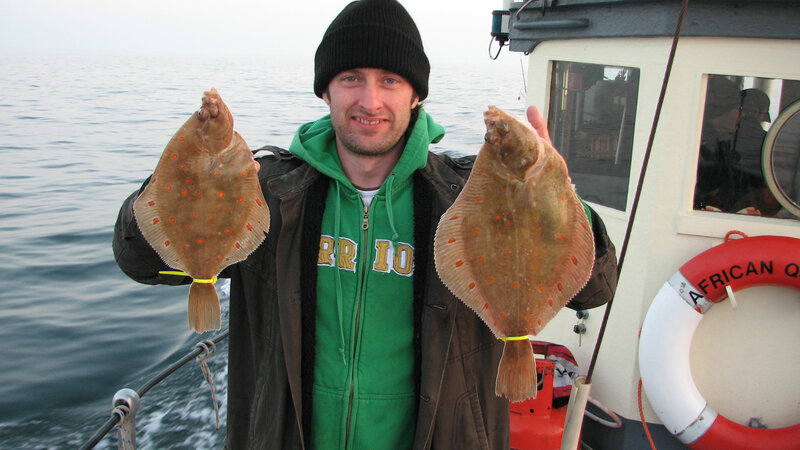 Some very good Plaice fishing with 101 Plaice caught over the first 3 days. 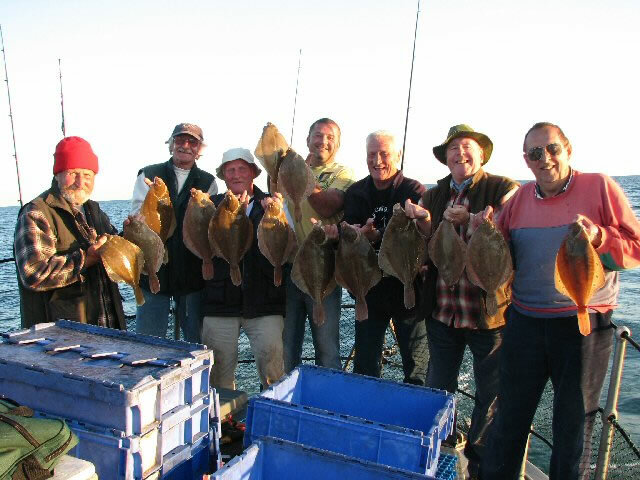 As the tides eased and the weather turned more to the East later in the week, the numbers of plaice caught dropped off but we still managed to find plenty to keep everyone happy. The best day was 43 with the worst only 11. 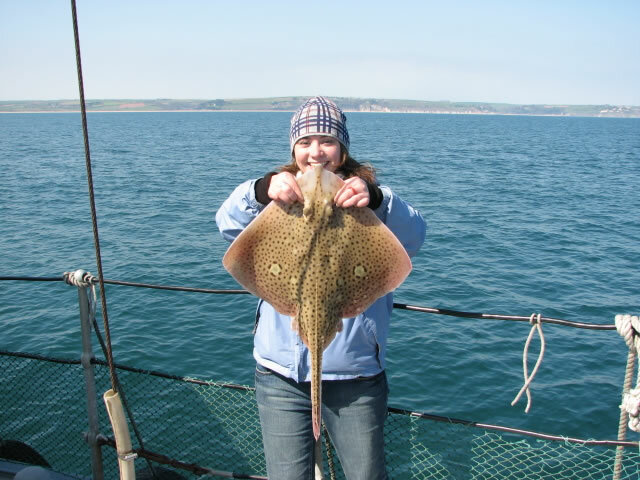 A nice Spotted Ray of 6 1/2lb, some Mackerel and Herring. 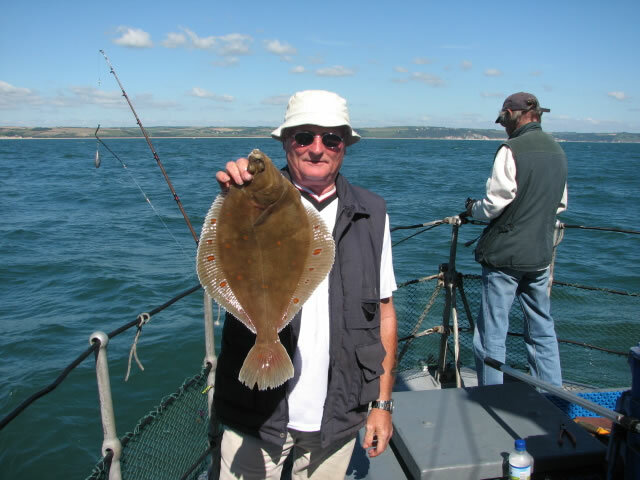 Best Plaice 3lb with lots between 2lb and 2 1/2lb. 14-22nd. 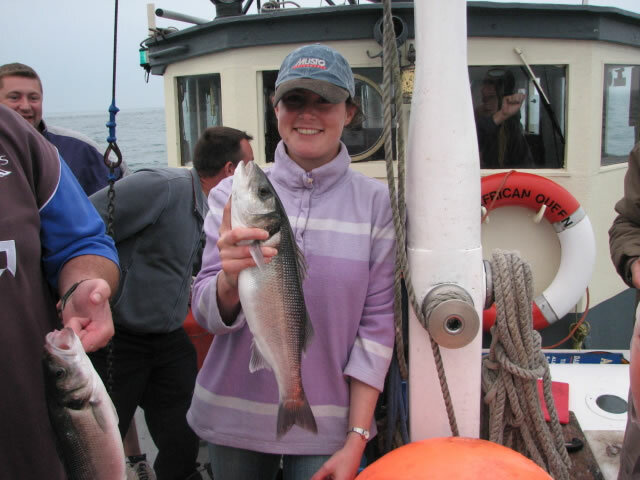 April Spent 4 days working on the boat pre major survey for insurance and M.C.A. I have not had the report yet, but talking to the surveyor he seemed to think the boat was ok, apart from a list of jobs to action re new safety legislation (2 jubilee clips on every pipe on the boat is now required, guards on fan belts, cooker no longer complies etc etc) Anyway glad that's over. Fishing, 15th. 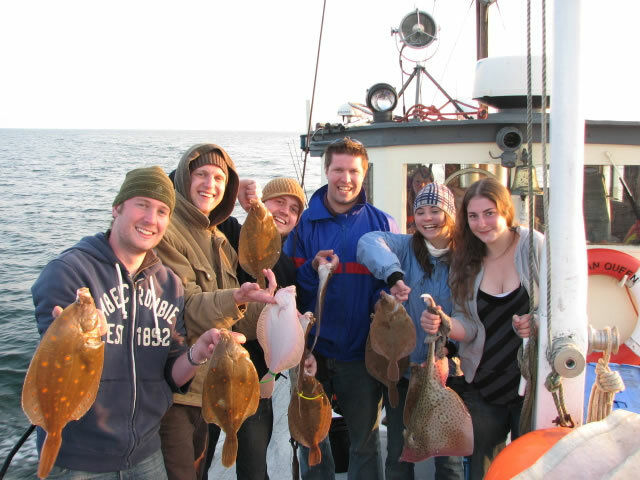 20 Plaice to close on 3lbs, plus bits, saw lots of Dolphins again, we have seen more Dolphins this season already, than we have seen in the last 5 years. Click the piccy of the dolphin on the left to see some video. 16th. Went to Dart Harbour Board meeting to plead our case against this years new pricing policy in the harbour. They have put the fee that they charge us for using the wall in Dartmouth up by 70%. The African Queen has used that spot for her Summer trading for the past 18 years. This year they expect us to pay £468 per month. This is on top of our mooring fees and harbour dues. Our business just cannot stand these increased costs. We will let you know the outcome. If you are regular customers of ours, and do not see us on 'the wall' where we have traditionally been, rest assured we are still trading, but you will have to give us a ring to book. 22nd. 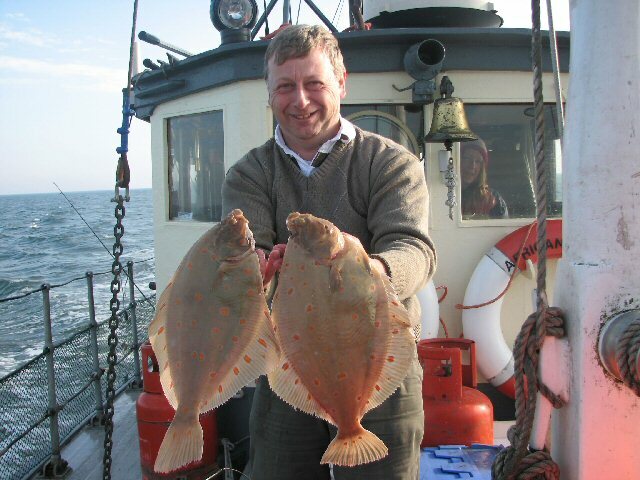 Plaice fishing slow today so targeted the wrecks for some Pollack, did manage a few Plaice late on in the day, with a nice brace for Tony, see piccy on left. 6th May. Another windy day, but at least we are out. 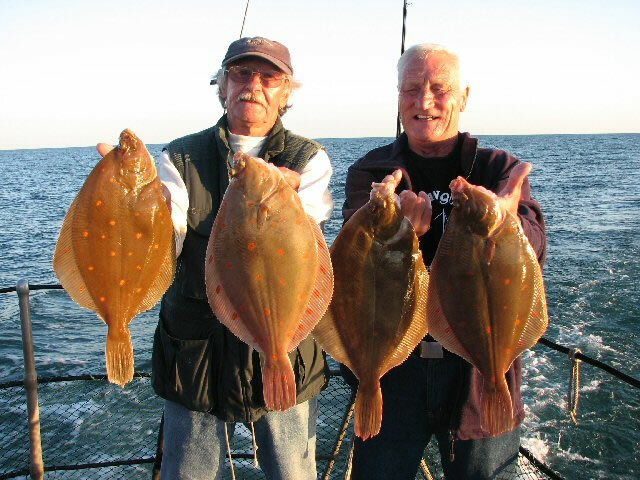 Fishing's hard because of the speed of the drift but we did manage 15 nice Plaice, see piccy on left for the best of the day. 9th.May. This was the weather at Rickham, last measured at 09 May 2007 10:00 BST In the previous 15 minutes the wind averaged WSW at Force 6, gusting to Strong Gale Force 9. 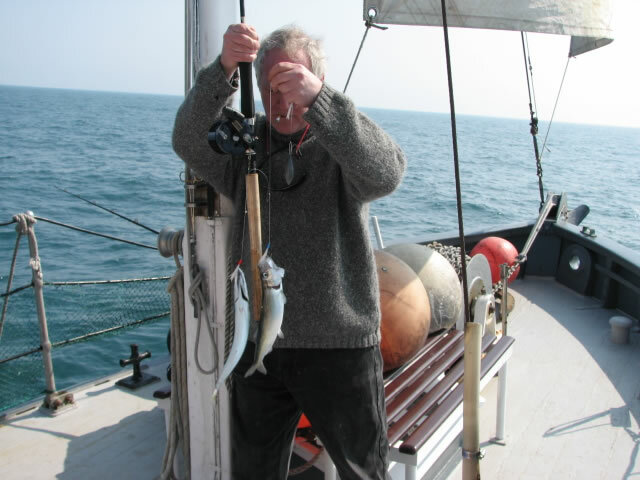 12th May Still not getting out,The maximum wind speed recorded in the last 12 hours was 37 Knots (Gale Force 8) at 11:25 BST 14th-22nd Getting out on a few trips, still getting some nice plaice but the numbers are thinning out as expected at this time of year. 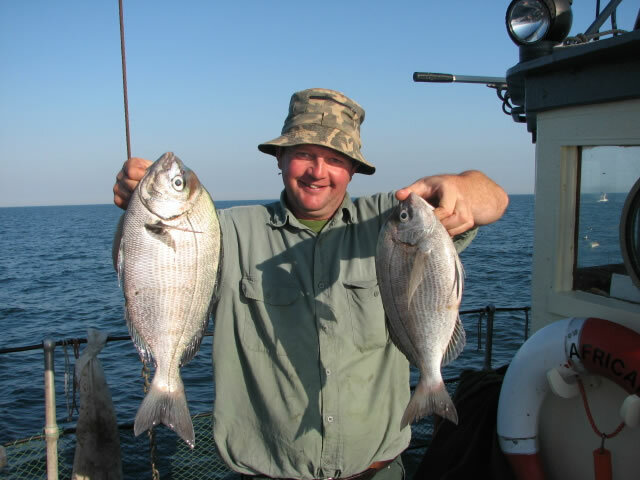 Bass are showing in good numbers, evening tides are better than the day. 22 has been our best bag over the last week, for just a couple of hours fishing. 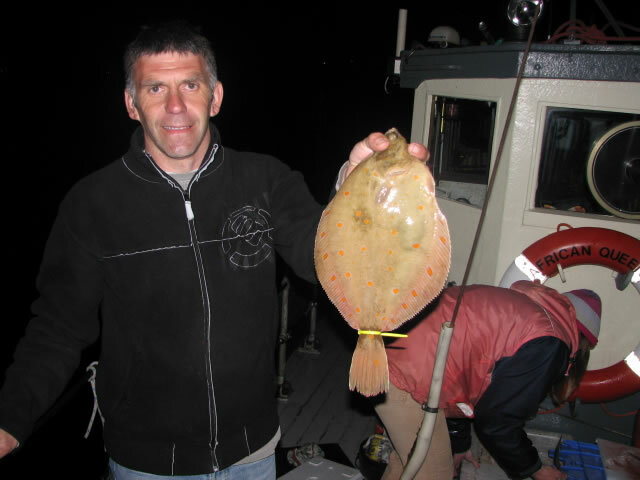 Most fish not huge with a lot just on the size limit, but plenty in the 3-4lb bracket. Whiting still showing in good numbers on the banks with some cracking fish among them. 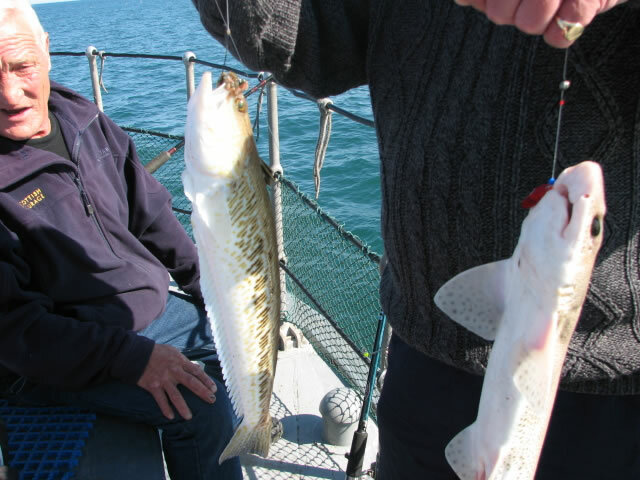 Summer fish starting to show, Gurnard, Garfish etc. 23rd. Fished as part of a 9 boat competition down here. An annual event for a transport workers union, bus drivers mostly, from all over the country. 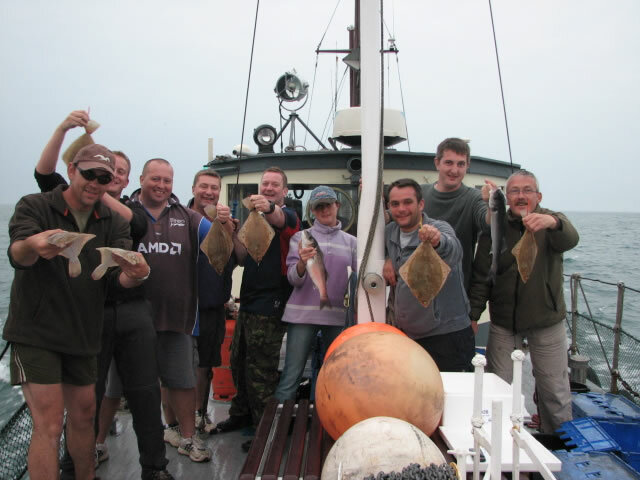 We had guys (and Gals) from Plymouth and Dundee fishing with us on the African Queen. 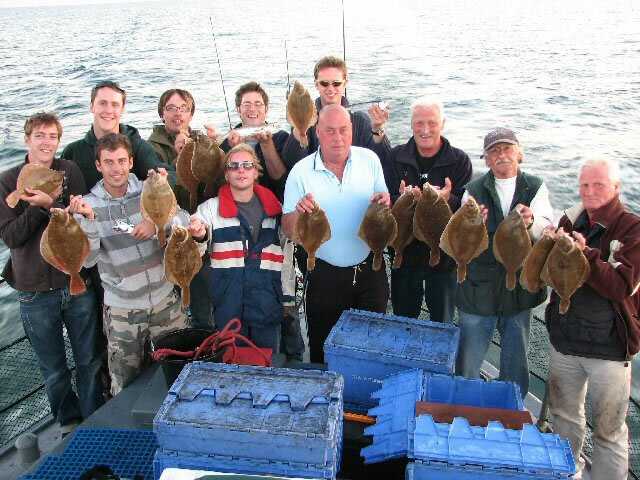 A great time was had by all, the competition was scored on a points system with most fish being returned. 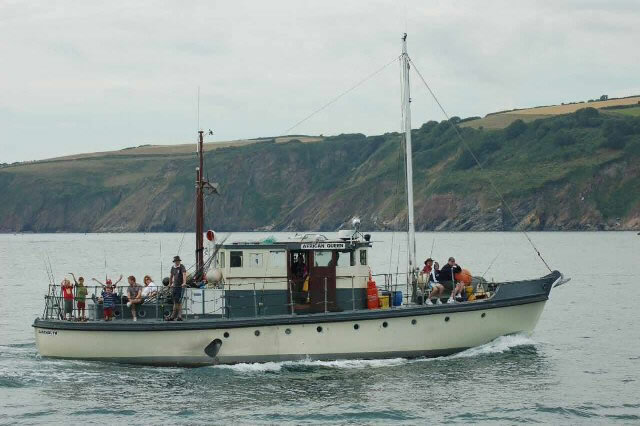 We came third out of the 9 boats with 207 fish (top boat had 222) so very pleasing for us, but even more so, was that 3 separate anglers on our boat won individual prizes. 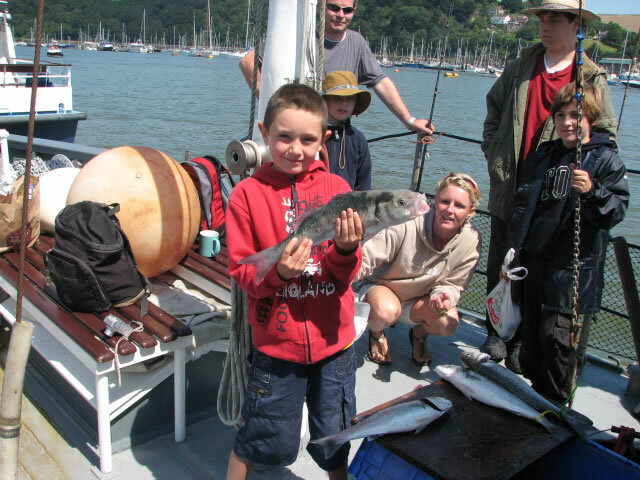 28th.- Half term week so plenty of half days with family's and kids, plenty of fish for everyone and lots of fun. See piccy on left of young Master Pyne with a nice Pollack caught from rough ground on feathers. June Another windy Month with a lot of trips cancelled again. We have managed to get out on the odd day with mixed results. 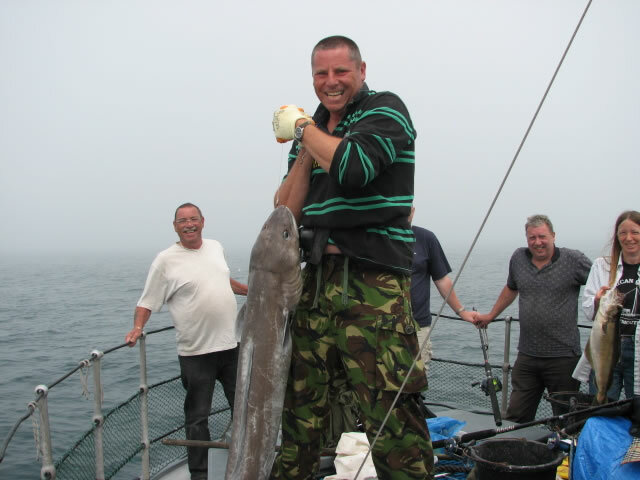 A nice Conger for Alan at 56lb, a Ling for Kim at 18lb. 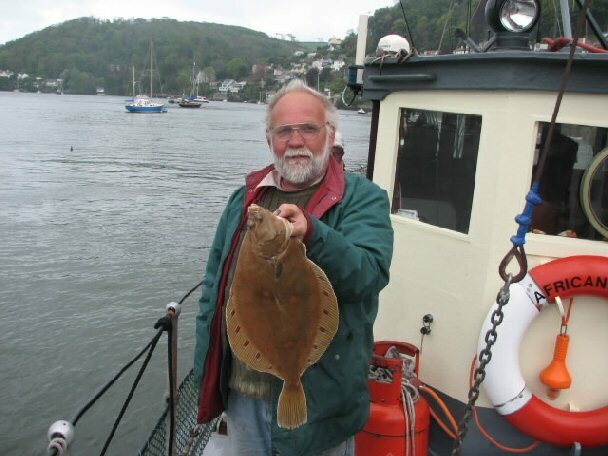 Still some Plaice about on the banks with all the other Summer species now putting in an appearance. Bass are here today and gone tomorrow on all the marks, but we can normally find a few for the better anglers if we persist. 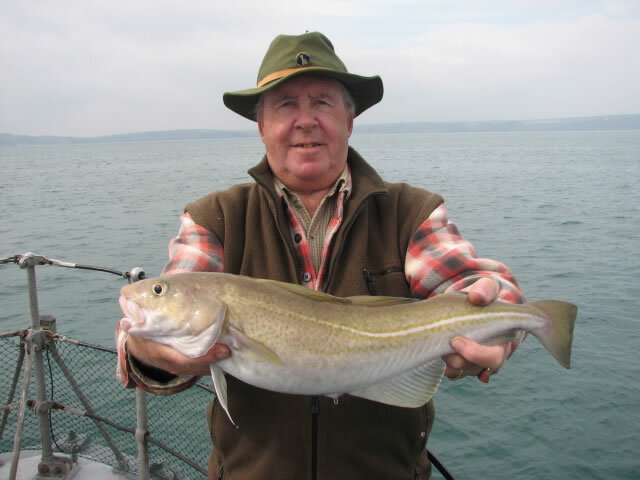 The wrecks are producing some nice Conger on the smaller tides when we can anchor them, with a lot of fish up to 50lb showing. 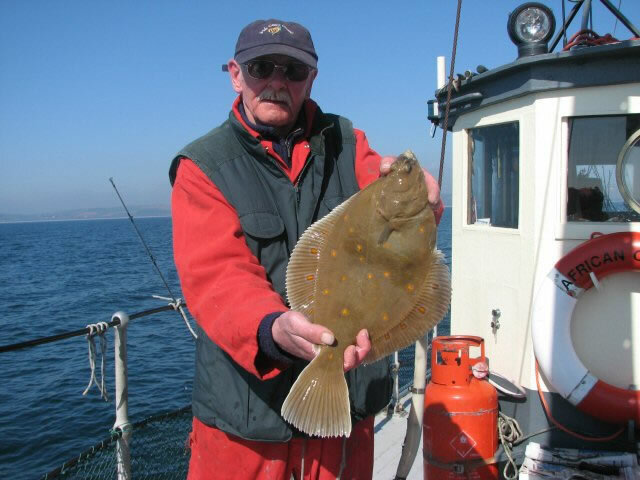 Pollack are on the inshore wrecks but are generally on the small side. 5 July This was the weather at Rickham, at 23:15 BST. In the previous 15 minutes the wind averaged WNW at Force 6, gusting to Strong Gale Force 9. 7/8th Decent weather at last. Had a group from Bristol down for the weekend. 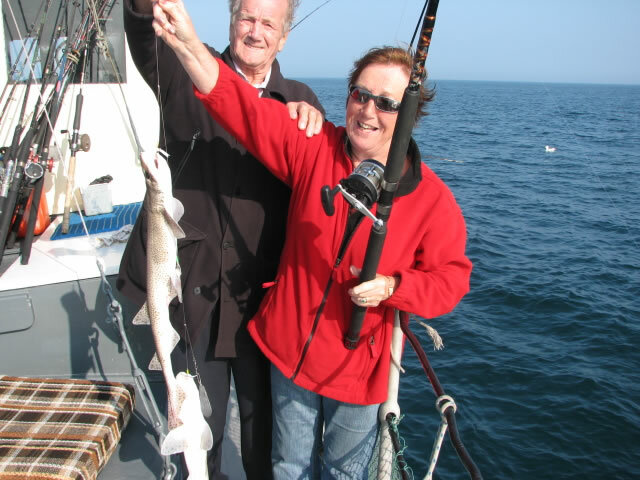 We have not managed to get out for a couple of weeks so were out of touch with what fish are about. 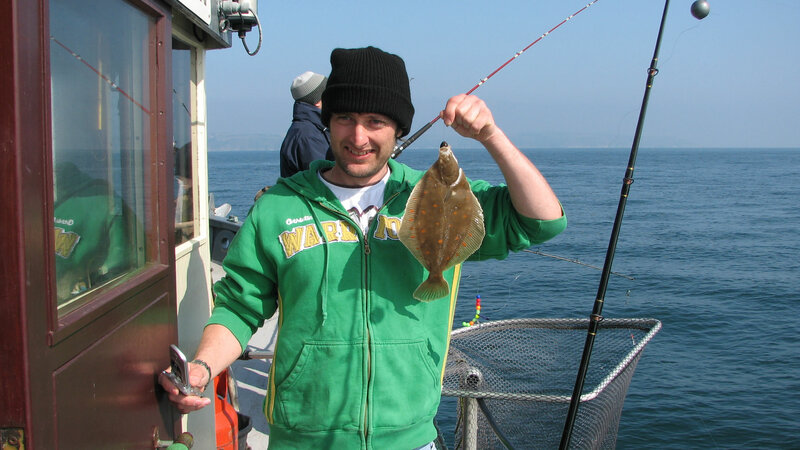 Went to our favored Bass mark but didn't manage to find any, so went to the Skerries to see if we could find any Plaice. 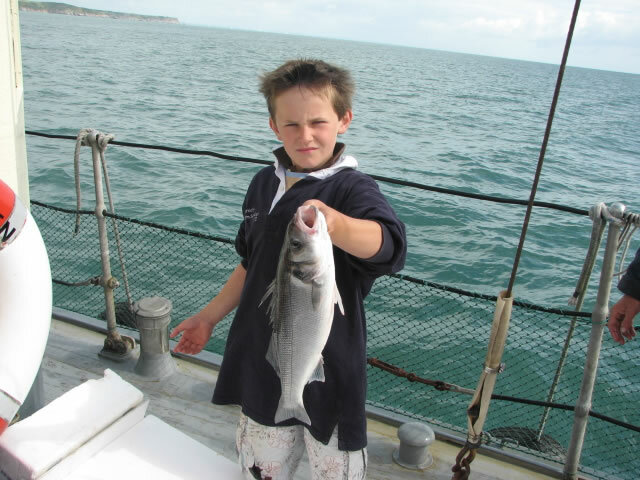 Managed 16 between the boys with loads of Whiting, Gurnard, Mackerel, Doggies etc. 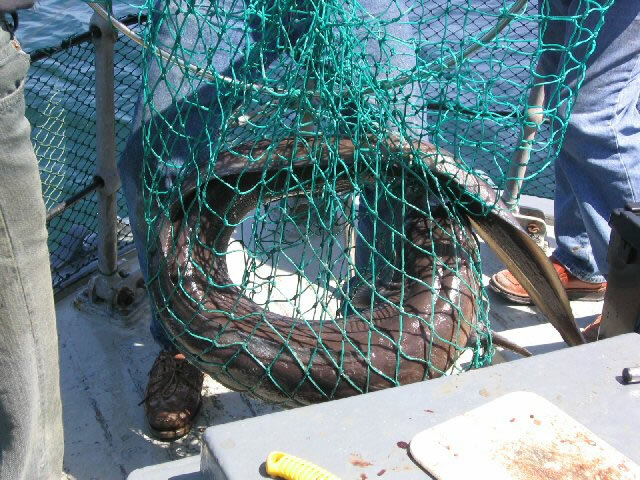 Sunday, fished an inshore wreck in the morning at anchor. Lots of Pollack on artificial's but only to 5-6lb. 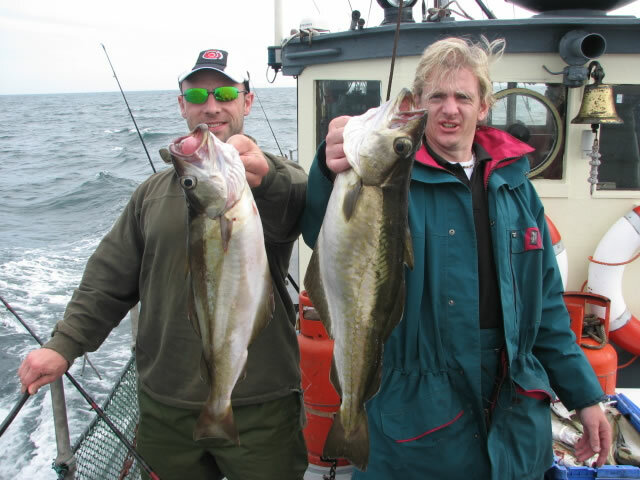 The lads who opted to fish for Conger could only manage to hook 2 with one good fish lost on the surface. 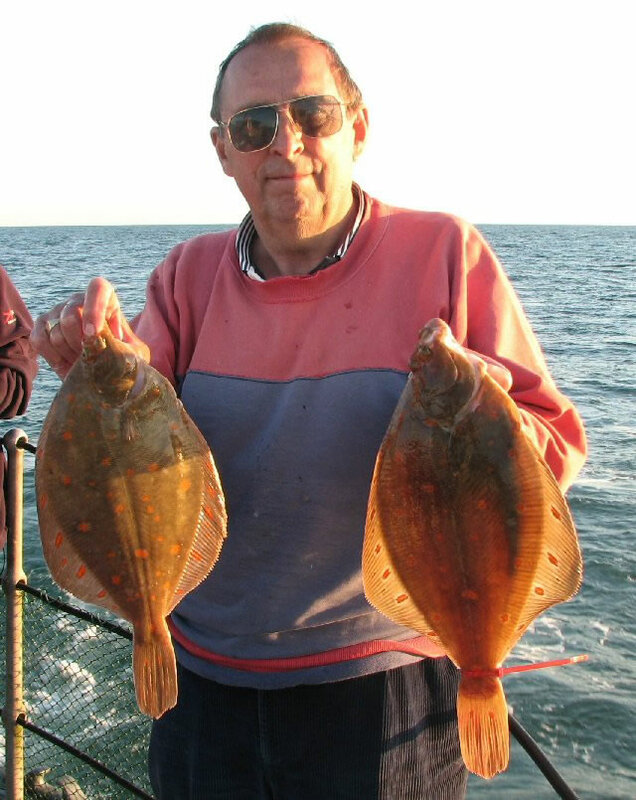 In the afternoon we decided to go back to the Plaice on the banks. We managed 11 nice fish with the average size much better than Saturday's, with fish to 2 1/2lb. 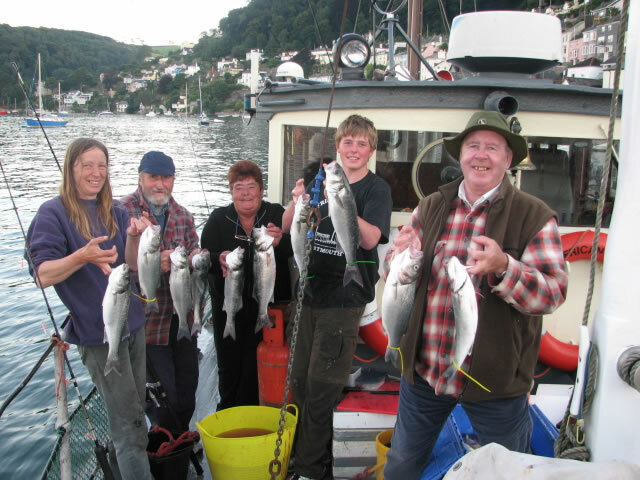 A box of Mackerel caught late in the day, to go home with nice and fresh, at the end of the day we waved goodbye to 11 happy anglers. 18/19th. 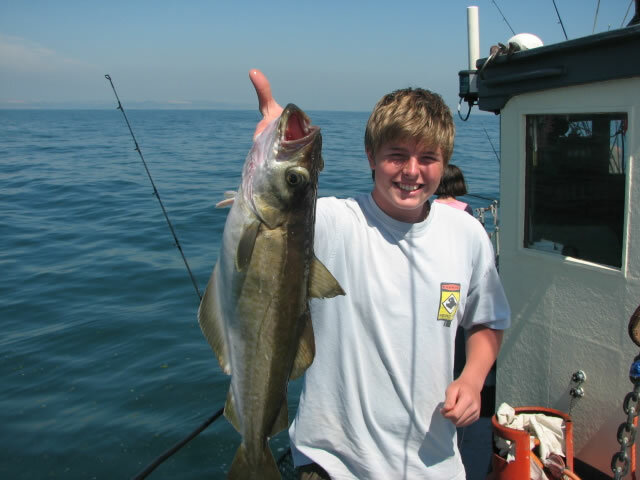 July Spent 2 very enjoyable days fishing with a group of students and 3 of their teachers from South Dartmoor Community College, as part of their Enrichment Week 2007. 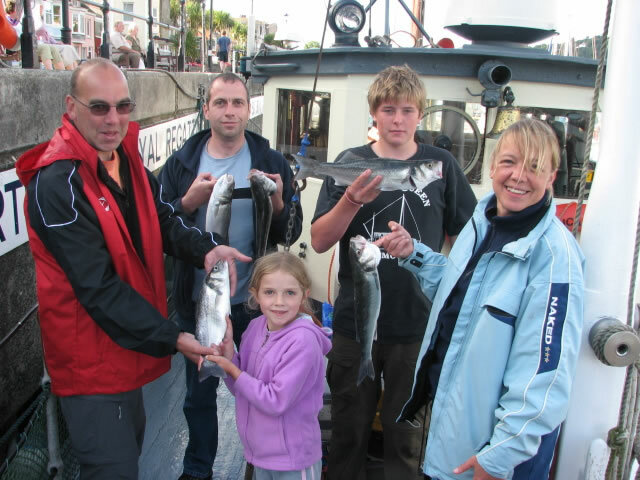 They caught loads of fish including Mackerel, Whiting, Cod, Pollack, Plaice, Black bream, Bass, Red Gurnard, Tub Gurnard, Scad, Weaver, Ballan Wrasse, Dogfish, Sandeel, Dab, Pouting & Poor cod. 17 species. 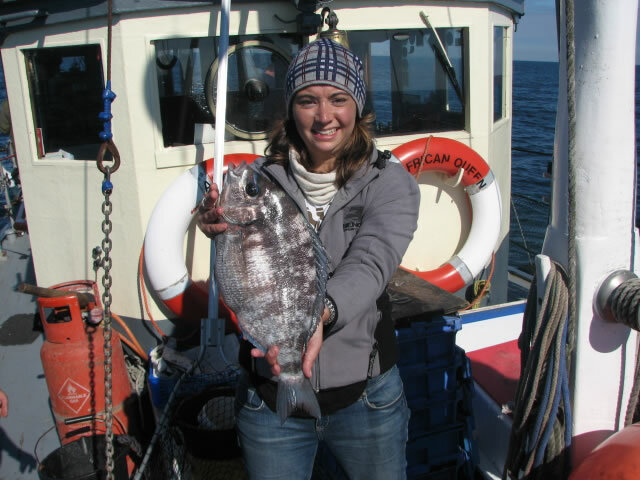 See the photo's on left, one of Jordan Mowatt with a superb black bream just an ounce under 4lb, and one of the teachers, (Miss) with a Pollack caught from African Queen. 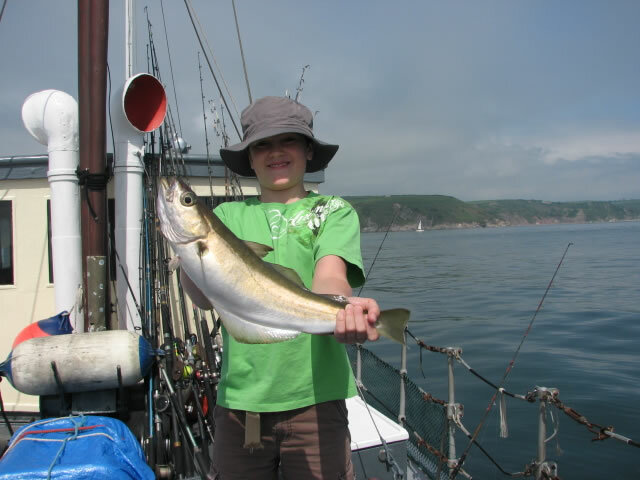 Jordan also managed a nice codling as a bonus for his day. 30th July/5th. 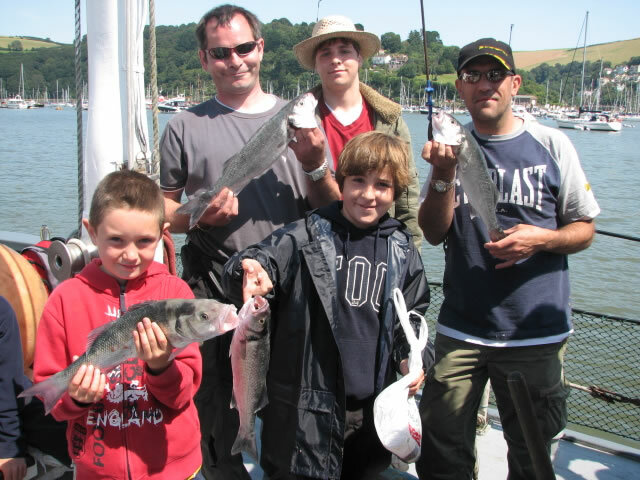 August What a week, decent weather, full bookings and over 200 Bass landed. The fishing has been superb. 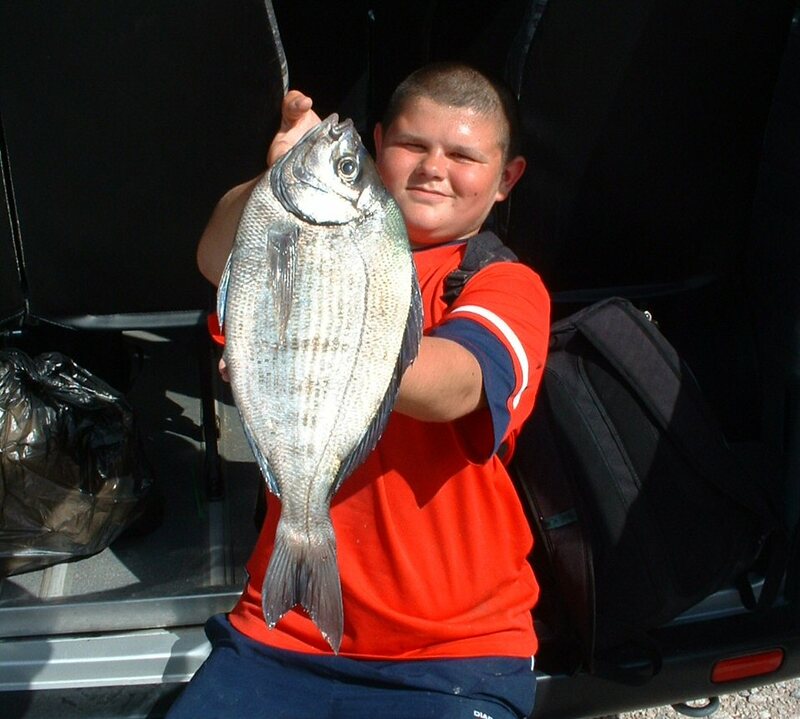 Individual anglers have had up to a dozen Bass on a tide. A lot of the fish are only in the 2 1/2- 3lb bracket, but with some fish to close on 6lbs. 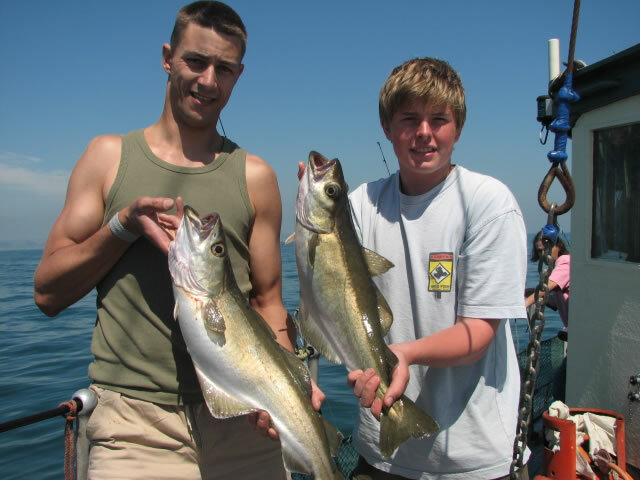 We encourage our anglers to return all Bass under our size limit of 41cm (16") The legal limit of 36cm (14") we feel is too small, as these fish have not reached maturity and consequently not yet spawned. 7th. 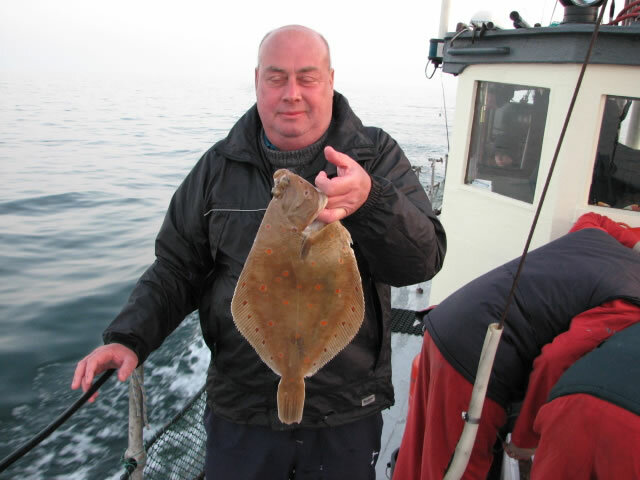 August, 33 Plaice to 2 1/2lbs, stacks of large Whiting plus all the other usual Summer bits and pieces. Another very enjoyable day. 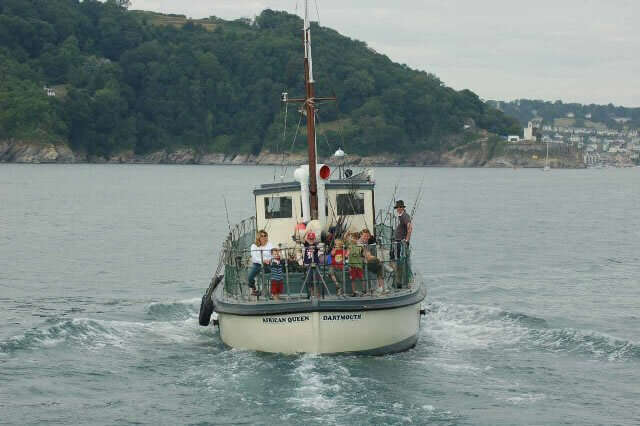 August and September, Sees us enter into our busy Summer holiday period, lots of half day inshore fishing trips with the Devon visitors. Some weekends and only the odd day spent with our more competent anglers. 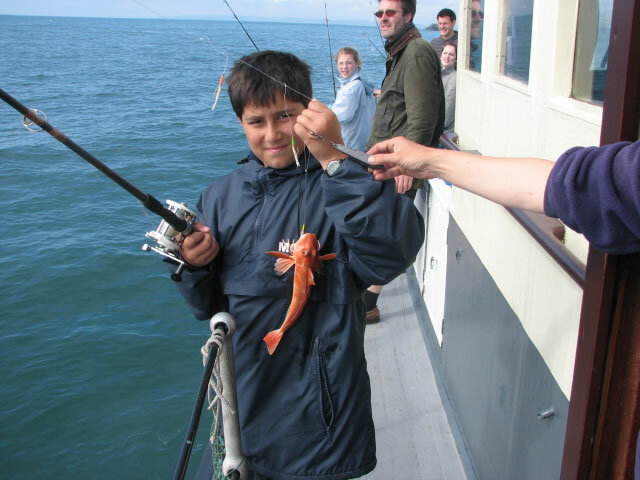 These trips were often worthwhile with some good fish being caught. 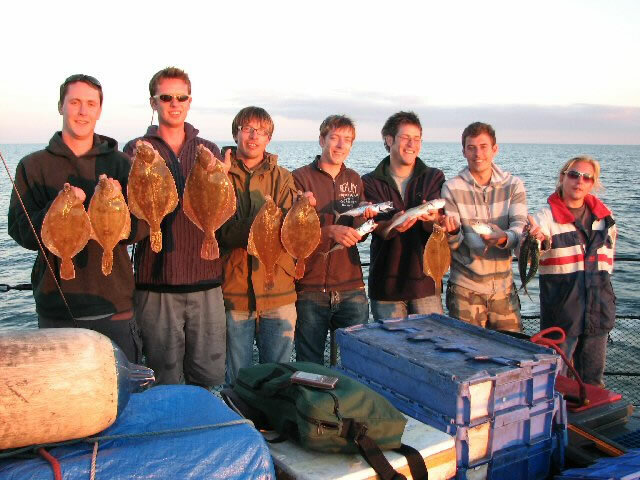 The highlights of the Summer included a 4 day run when The Brighton boys, (who come and stay onboard for a week at a time) landed 259 Plaice to 4lb. A lot of their fish were returned. 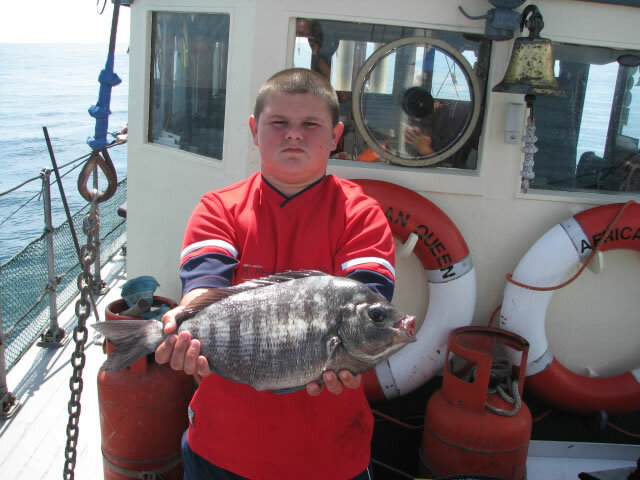 We have been catching a few nice Black Bream to close on 5lb. you need patience, but they are there if you are prepared to fish for them. 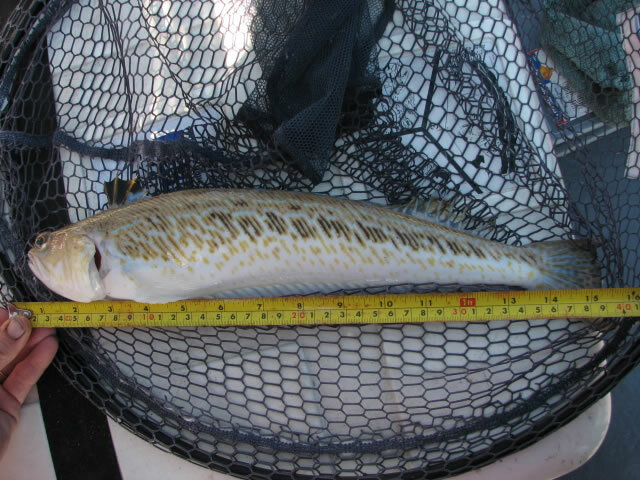 We had a huge Weaver fish, the largest I have ever seen caught. We did not weigh it, and returned it alive. When I looked up the record, it is only 2lb and a few drams. How I wished I'd weighed it. 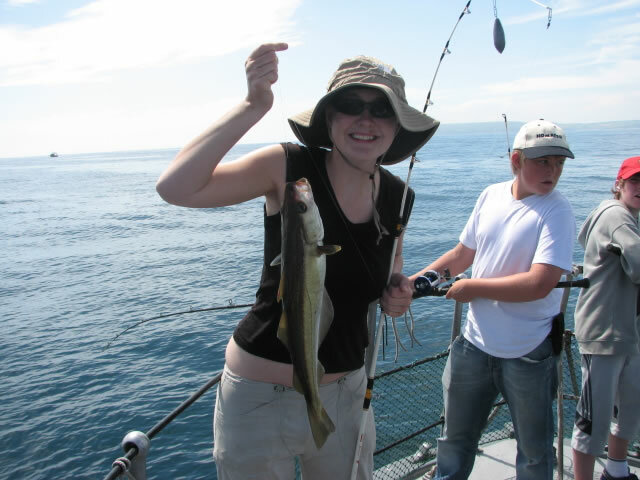 Look at the photos and tell me that fish is less than 2lb.!! 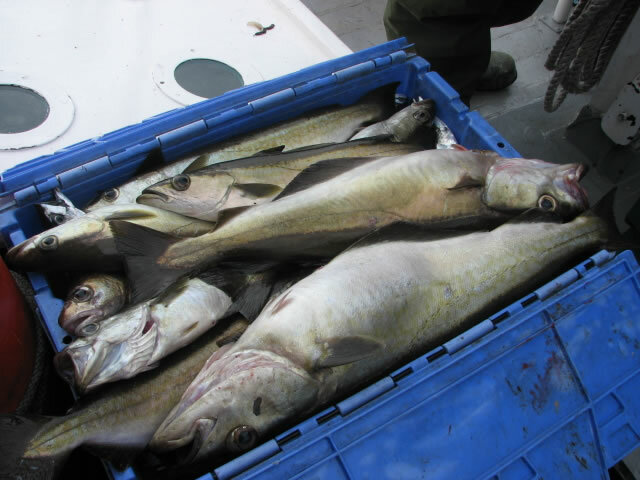 The first of the Autumn Codling came as a suprise, we just hope that there will be a few more on the Banks than showed up last year.